There are pizza chains and Italian chains aplenty in the UK but some are more omnipresent than others. I read once in a newspaper review that Pizza Express was the most flexible dining option for any occasion. Equally fine for treating the kids, a business lunch or a date. It’s not too cheap, it’s too expensive. 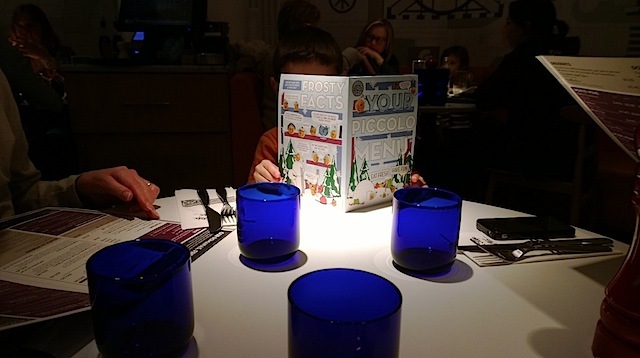 You’d think such a place would be mundane yet Pizza Express manages to do all this with personality and keeps those pizza bases spinning new ideas. For a start, I love how the interior of every Pizza Express branch is individual. Yet they have finishing touches of the blue glasses, the giant red pepper grinders and Venetian black and white stripes so you know where you are. My first ever Pizza Express visit was when the branch in Southgate, north London opened in a cavernous long vacant unit previously occupied a supermarket. I was a student at the time and this jazzy pizza restaurant quickly become the local favourite for Middlesex students to take any visiting relatives. I loved that the menu said they’d opened their first branch in Soho in the 1960s. I love that they gave donations from their Veneziana pizza to some Save-Venice-From-Sinking fund. Pizza Express seemed European, stylish and funky yet accessibly affordable to my student pocket at the time. And this was before Orange Wednesdays 2 for 1 offer at Pizza Express that students of today must LOVE. 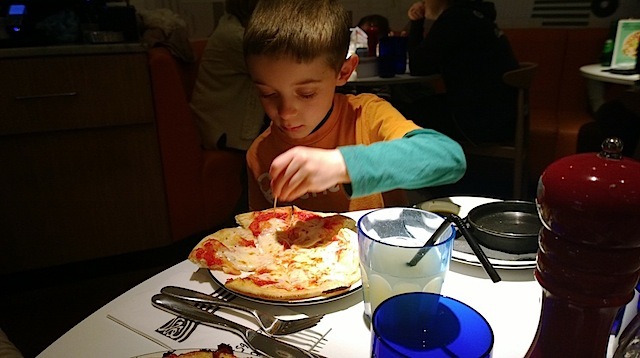 So I feel quite old really to note that it’s now 20 years since I first ate in a Pizza Express and now I take my son there on a fairly regular basis (he likes to spread his dining options unsurprisingly). 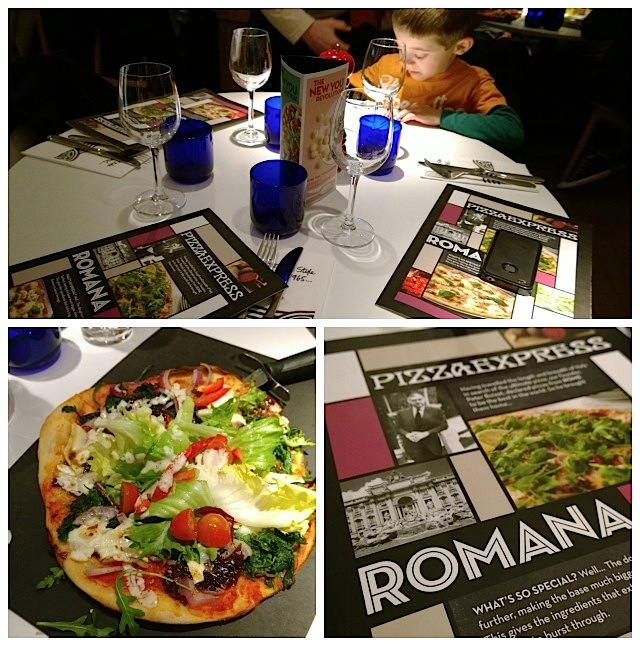 For the first few years I went there, Pizza Express seemed to have had the same menu forever – the American Hot, La Reine, the Salad Nicoise and of course those dough balls. But in the past decade, with greater competition from other chains, the Pizza Express menu has become wider with new classic favourites emerging (do we remember a time before Pollo ad Astra?) and regular limited edition dishes. 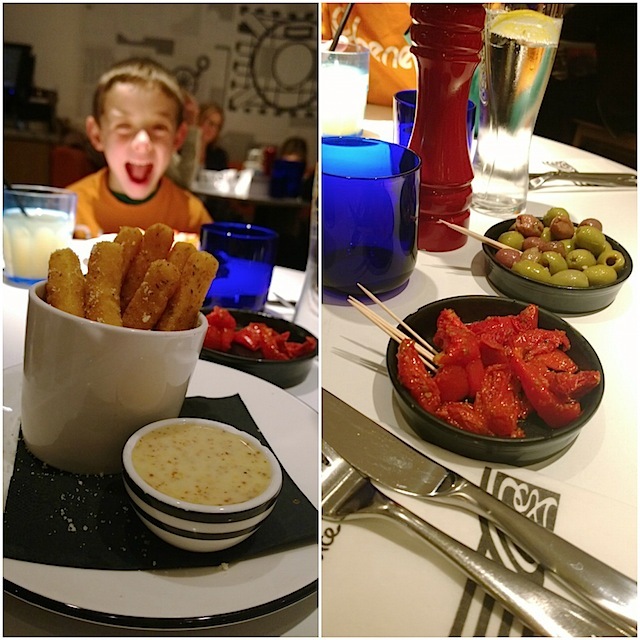 We have made two visits to Pizza Express in the past fortnight – circumstances just made it turn out that way so the pictures here are a mix of ones taken at Westfield Stratford City branch and Canary Wharf. Above we have polenta chips photobombed by Ted and appetisers of olives and sundried tomatoes. If I’m honest I’ve been spoiled by polenta chips at Fire & Stone over New Year, these ones were less crispy but like I say, I was spoiled by some really good ones recently otherwise I’d not have noticed. On our second visit we had limited edition Dough balls with Gran Moravia cheese and garlic butter. OMG these were amazing. I could have eaten a plate just of these really. The other limited edition dish we made our return trip especially to try was this sweet potato sauce based pizza. 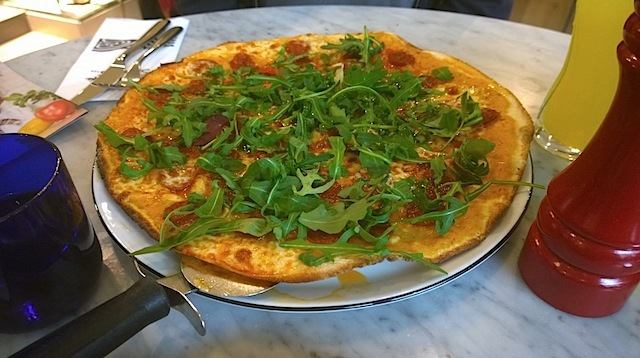 It’s called the Vesuvio and has a romana stretched base covered with n’duja, sweet potato rather than tomato, mozzarella, Gran Moravia cheese , rocket and chilli oil. You’d never have missed the tomato and the n’duja sausage packed a punch that would knock out American Hot any day. I imagine if you’re allergic to nightshades then pizza would be off limits and it’s great to see allergy friendly dishes at Pizza Express. They’ve also led the way serving gluten free pizza options. I was all set to order the other limited edition topping “cipollini” but my attention was grabbed by “caprina rossa” a vegetarian topping featuring slivers of beetroot, goat’s cheese, rocket and red onion. I really like how you get fresh salad leaves on top of your pizza – if you order the 500 calorie leggera, you even get a hole in the middle filled with salad (seen on in top photo from our Westfield visit). And did I mention how I really enjoy cutting my own triangles with the pizza wheels? 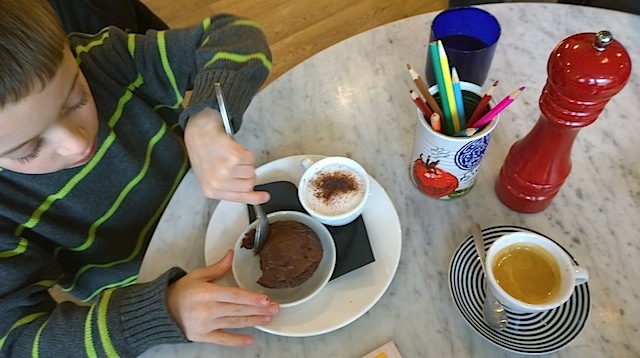 The Piccolo menu for Ted comprises an appetiser of dough balls and salad, a choice of pizzas or pasta, a choice of mini desserts topped off with a babycino frothy milk dusted with cocoa. And of course there are crayons and things to colour in. Kids these days don’t know they’re born, we never had any of this entertainment in the 80s but then apart from Berni Inn and Macdonalds, the provinces didn’t have many restaurants in the 80s. Pizza Express having spread it’s Soho roots now has branches up and down the country. I’m hoping the new cinema complex in Walthamstow will get one when it opens later in 2014 – might as well put that request in now whilst they’re watching. My nearest branches to home are Chingford and South Woodford but I think Walthamstow has a tested market of its own now! 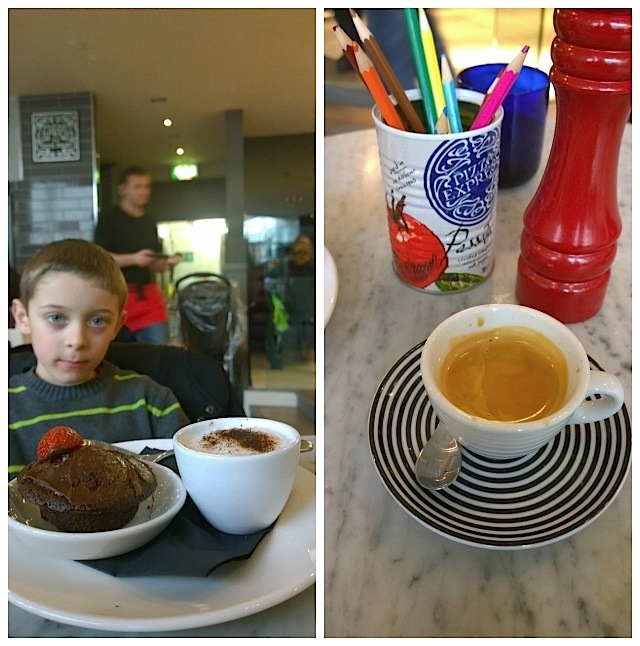 Another Pizza Express innovation for grown up desserts – dolcetti. 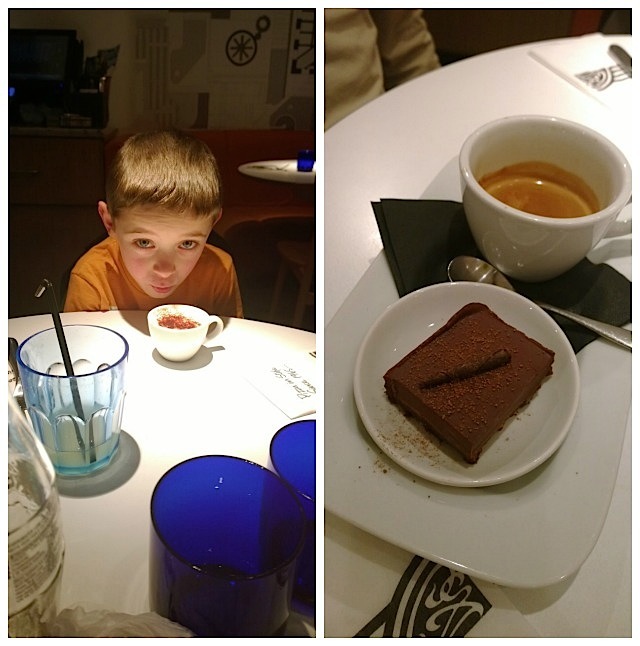 Given that I don’t drink coffee and my husband isn’t always bothered about dessert, these mini servings of cake alongside an espresso hit the spot just nicely for both of us. For 10 years I spread the rumour amongst my British friends that Italians, when posing for photographs said “pizza” instead of “cheese”. Last year I reminisced with my Italian friend Anastasia that we’d seen guests do this at her wedding. 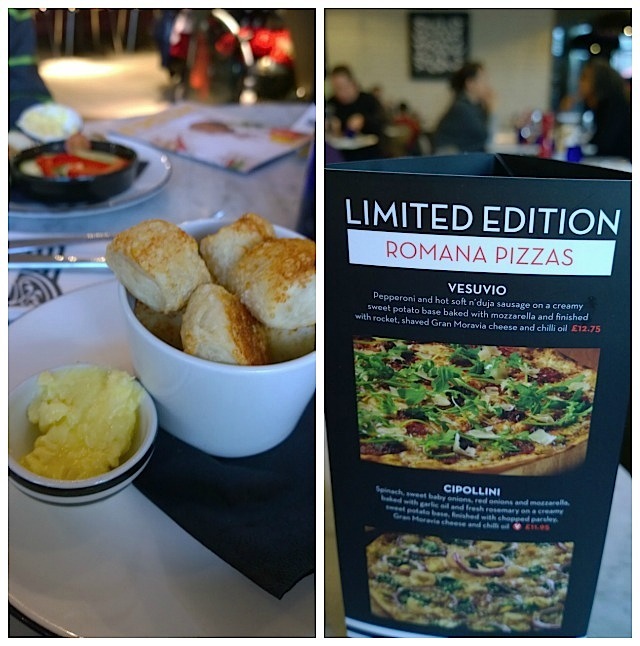 With thanks to Pizza Express and Westfield Stratford City for dining vouchers. For further info about Westfield read my recent post We are definitely dining at Westfield Stratford City. Pictures in this post were taken with the Nokia Lumia 1020 windows smart phone which I’m using during my participation in Microsoft’s “Loop” bloggers’ outreach program. Lovely post. I really like Pizza Express, and they’ve never let me down. 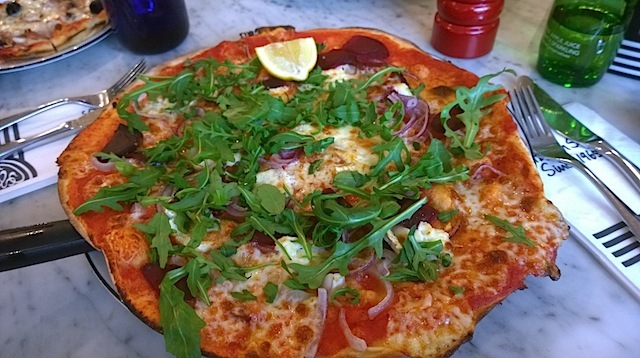 I’ve always had a lot of time for Pizza Express – as you say, not too fancy, not too plain, not too expensive, not too cheap and their standard is always consistent. And, of course, they have doughballs!! Great post. Ted will soon be able to write his own reviews. Come to think of it, he did didn’t he, on the feedback sheet when we went in Nandos at Southampton. I love pizza express. Especially the new mushroom bruschetta with the bechamel sauce. It is amazing!